l I love ideas like this – I have no idea how it was done to such detail. This would literally last for a lifetime plus (just replacing the cushion). I would believe it could have also been cut so that instead of one side being left it could have been cut so the back and small amounts of sides could have been left to make a couch. The paint used must have been enamel and I imaging polyurethane was sprayed to make a finish that is very durable. 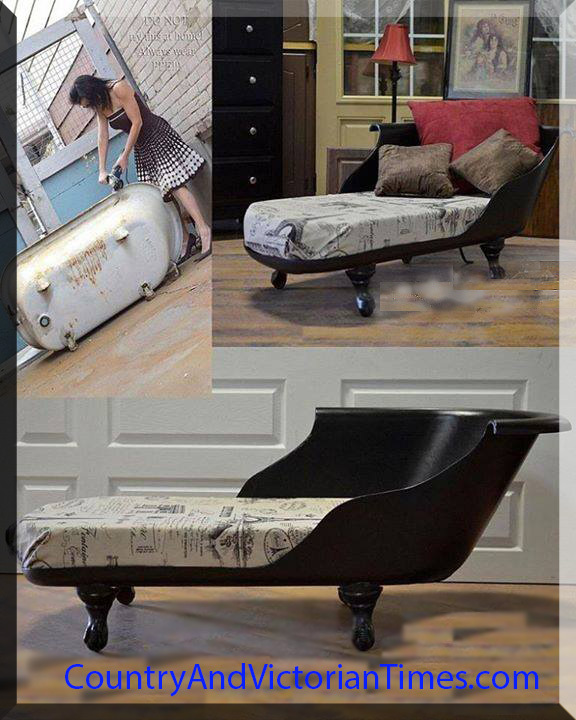 This entry was posted in Antiques, Crafts ~ DIY ~ Projects, Home, Car, Yard, and Pets, ~Decorating, ~Furniture, ~Recycle & Upcycle, ~Recycling & Upcycling and tagged antique, couch, cusion, enamel, fabric, furniture, recycle, repurpose, seatee, tub, ~Decorating, ~Home. Bookmark the permalink.